Proponents of the Affordable Care Act have failed to get the message across that the current spike in chronic care provision and high costs will not last forever. 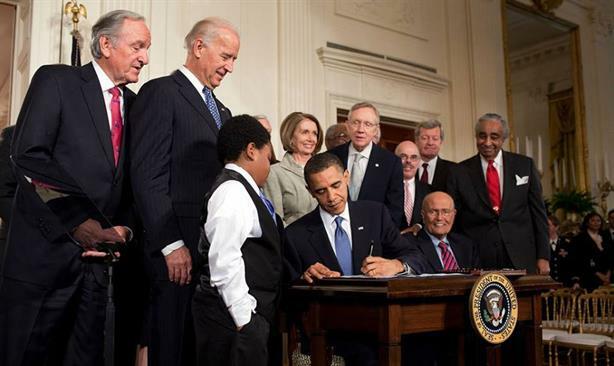 Six years ago, President Obama signing the Affordable Care Act on March 23, 2010. To say the Affordable Care Act has had a rocky start to its life would be one of the biggest understatements of recent years. From the federal statute’s torrid path through legislation in 2010, to the botched rollout of the HealthCare.gov health insurance exchange website in October 2013, to the current swathe of health insurers pulling out of state-run health exchanges, nothing has been easy about this transition. If the Democrats don’t get back into power after November’s election you can be sure the scrapping of Obamacare will be high on the agenda. And even if they do, there are likely to be some root and branch alterations to the current system. One way or another, the fate of the Affordable Care Act will go a long way toward defining Barack Obama’s presidency and legacy. It represented the biggest change to the American health system since the introduction of Medicare and Medicaid in 1965. But given it is such a massive change, should we really be surprised it is having teething problems in establishing itself as a sustainable, long-term system? In this week’s excellent analysis piece by PRWeek’s Chris Daniels, Gil Bashe, managing partner, global health at Finn Partners, makes an excellent point. He observes there was always going to be a costing spike at the start of the act, as a large legacy patient population entered the system with serious chronic illnesses. It will take time before the long-term absence of a formal healthcare offer for a section of the population is caught up to. On the other side of the coin, the healthy, younger folks who aren’t going to use the system as much in the short term and who will balance out the discrepancy at the other end of the spectrum are not yet signing up in great numbers. Furthermore, there’s a big education job to be done in promoting the healthcare offer to diverse groups, such as the 22% of California’s population who are Asian-American and the 40% who are Latino. In this febrile and confused environment, it’s not surprising health insurers such as Aetna are tempted to play politics with the situation to try and force regulators to look more favorably on its proposed takeover of Humana. For those in favor of the Affordable Care Act, it is to be hoped all stakeholders involved can establish a strong enough narrative to buy the time needed to allow the system to settle down and overcome the built-in higher cost period at the start of the process of building a universal healthcare system. As Bashe concludes, this is both a challenge and an opportunity for communicators working across the health space, whether in the government, health exchanges, or the agencies supporting these institutions and organizations in telling their stories. If this communication is to succeed, it must double down on the message that costs will eventually settle down as illnesses are better managed and preventive health measures and lifestyle makes good sense for everyone. Otherwise, the well-meaning but problematic passage of Obamacare into long-term reality is destined to end in failure.